The moment I picked up "Dear Abigail" from my college library I couldn't put this book down. 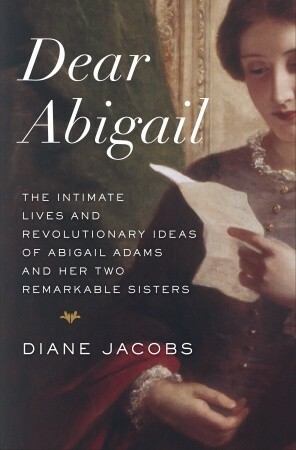 "Dear Abigail" by Diane Jacobs details the accounts of Abigail Adams (Smith), wife of President John Adams, and her sisters through letters and journal about their remarkable lives during the Revolutionary War and the Birth of the United States. As a reader, you feel like part of this sisterhood of struggles and survival, doubts and dreams, and ideas that where ahead of most women in the 1770s. Abigail, Mary, Elizabeth shared their ideas and opinion concerning The Great Awakening, The Enlightenment, women's rights, salvary, marraige and motherhood, and so much more! "Dear Abigail" gives a different perspective how these women helped shaped the course of our American History and various social/political policies! It is easy to get involved in the daily lives of Abigail, Mary, and Elizabeth as if you knew them all your life! It is easily to get frustrated at the "archaic" viewpoints concerning women and other social groups but that is how it was in the 1700 to 1800s time period. I highly recommend readers to read "Dear Abigail" by Diane Jacobs which makes any excellent summer read or while enjoying this Fourth of July weekend! Looks like a great book! It's hard to find books on history that keep my attention for too long, but this seems lovely. I love how the author use the narrative to explain the story of these extraordinary sisters!! I feel its like reading "The Babysitters Club" or "Traveling Pants"